A 3' (90cm) long brush for cleaning homebrew barrels. When shippping this item, we have to bend it to make it fit the packaging, so please be careful when opening your order. Cleanliness is an absolute essential when making your own beer and wine at home. 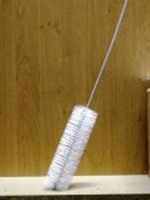 This 3' (90cm) long brush makes it far easier cleaning barrels and wine fermenters, especially those with a 2" neck. The length of this item means that we are forced to bend it in half in order to pack it for shipment. Please be VERY careful when opening your parcel.